Your pup will race to the top of class with the Winsdor Check Nouveau Bow Luxury Dog Collar by Susan Lanci in Puppy Blue. 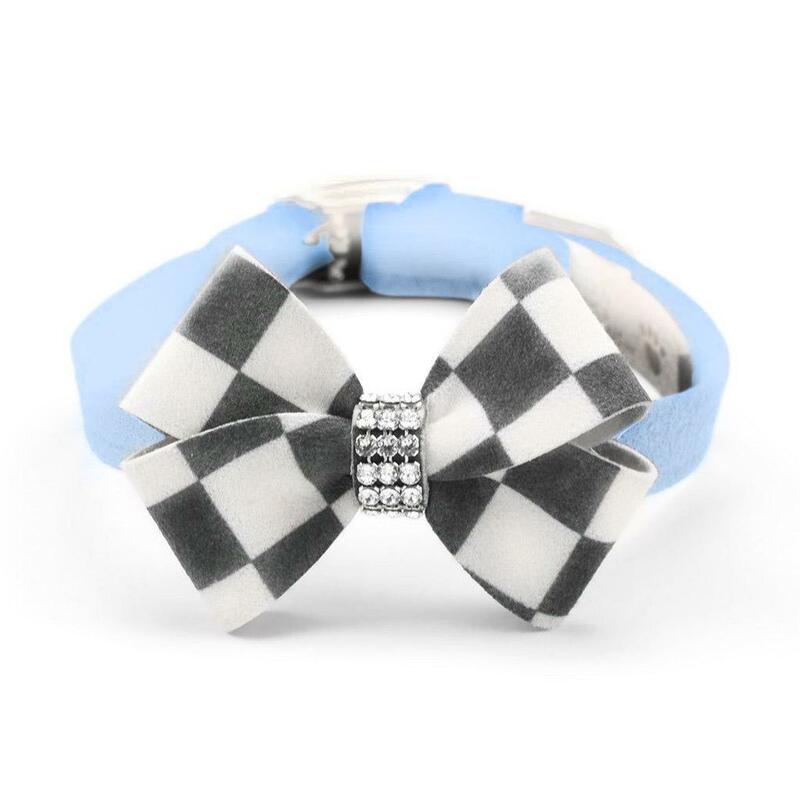 The Windsor Check Nouveau Bow Dog Collar captures attention with bold curves in cream and charcoal checks and 3 rows of dazzling Swarovski crystals paired with a Puppy Blue band. Comfortable for your pup and easy for you to maintain. Like all of our Susan Lanci designs, this 1/2 inch collar is made from genuine commercial upholstery grade Ultrasuede® fabric that is imported from Japan. This soft, comfortable fabric is breathable, washable and colorfast. This collar is manufactured in the USA. We recommend the dog should always be walked with a harness. Our collars are designed for ID tags, charms and for decoration. They are not designed for pulling dogs. I have two Alpine Quick Hitch slip knot leashes for our doggie, "Mackie". We absolutely LOVE them! We have also ordered these leashes and have given them to three other friends that have doggies. They love them too. We ordered another, and this leash has an adjustable toggle that is so tight it is very difficult to move. I am trying to decide if we should keep it and try to work it out (hoping it will loosen over time), or return it for a replacement. We haven't had this problem with any of the other Alpine Quick Hitch leashes we have ordered from Baxter Boo.